Food Banks Canada’s HungerCount report is a critical tool for looking at hunger across Canada. But the report is only as good as the information we put in it. To make sure your HungerCount report is as accurate (and efficient!) as possible, take a look at our five tips below! There is no better time than before the March HungerCount to ensure your client data is 100% up-to-date. A quick conversation with your food bank visitors is a great way to make sure each client’s profile contains the most current information. You can even use Link2Feed to automate the asking process by setting a “forced review” for the month of March. This gives your intake workers a reminder to review the entire client file and prevents them from recording a visit until they’ve done so (see instructions here). Be sure to pay close attention to the “First Food Bank Visit” field at the top of the personal page. This field relates directly to Question #17 of your HungerCount Report about “First Time Households”. Leaving the question to read “Today” or “Unknown” will lead the system to consider the client part of a “first time household”. If you don’t know the exact date, make the best estimate possible. For example, if you know the client first visited in the spring of 2010, you could put the date as 2010-04-15 to give an approximation. Be sure to practice running your HungerCount report before the end of March so you’re prepared to submit it when it’s required. Click here to read instructions on how to create this report. We also recommend running the report several times throughout the month to check on progress and ensure that data is being entered correctly. Set a weekly or bi-weekly reminder to review the report during the month of March. Click here to learn how to schedule a recurring report so that it will show up automatically in your inbox each week. 4. Don’t forget about the other questions! Link2Feed helps automate questions 6-14 of your HungerCount, but don’t forget to answer the rest of the important questions outlined by Food Banks Canada in the report! Email connect@link2feed.com to register for one of our HungerCount Help webinars. We will also be announcing the new features being released in our Version 2.4.2 rollout. Be sure to sign up right away as spots are available on a first-come, first-served basis and always fill up fast! 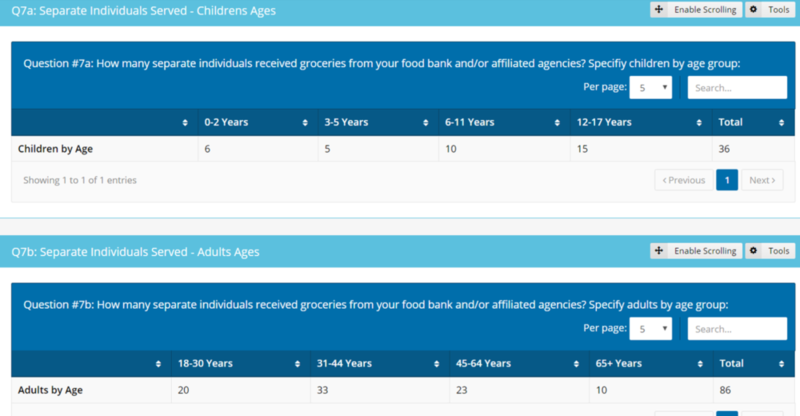 You can add your answers from your Link2Feed report into the HungerCount survey provided by Food Banks Canada or print off your report from Link2Feed and attach it to the Food Banks Canada form. We’re very excited to be a part of the HungerCount reporting period and hope these tips will help make using Link2Feed for your HungerCount as smooth and accurate as possible. If you have any questions before, during, or after the HungerCount period, please reach out to your network administrator for help. If you are a network administrator, contact our support team at any time by emailing support@link2feed.com.